Here, we will see discuss types of soil in India and what are their specialties when it comes to growing crops. 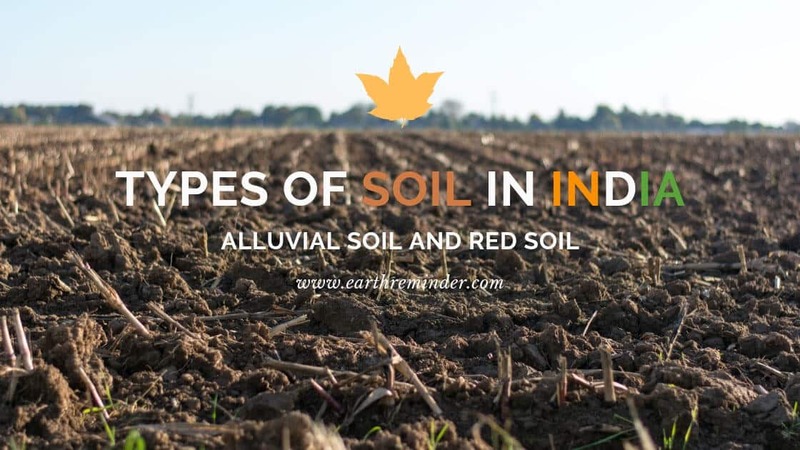 There are 8 major types of soil in India, but first lets understand meaning of soil. The upper layer of earth’s crust is being formed by soil capable of supporting life. It is made up of loose rock materials and humus. The soil forming processes are mainly influenced by the parent rock, climate, vegetation and animal life. According to the definition, it is a mixture of substances, composed of, minerals, water, air, decayed plants, and animal matter, it includes all the things which supports life on earth together. The most important and widespread category of the soil is alluvial soil. Alluvial soil in India is covering about 15 lakh sq km area in India, that means 46 percent of the total area. It is rich in potash, phosphorous and lime but lacks nitrogen and humus in it. It is the most fertile soil and it supports any kind of crop in it. Basically, this soil is suitable for Kharif and Rabi crops like cereals, cotton, oilseeds, and sugarcane. The Ganga-Brahmaputra valley is very useful for jute cultivation. This kind of soil is basically found in the northern plains from Punjab to West Bengal in the west, and Assam in the east, Bihar, Haryana, Orissa. They have been brought down and layaway by three great Himalayan rivers- Ganga, Brahmaputra and Sutlej, and their tributaries. Mostly all the large river basins are made up of alluvial soil. These rivers contain a large amount of alluvial soil in their basins. KHADAR– The fertile ones are known as khadar. Khadar soil is lighter in color than bhanger soil. It is found in the new river beds. BHANGAR– Bhangar is the older version of alluvial soil and we can also say that it is the older version of khadar. It is less fertile in comparison to khadar soil. Bhangar soil is darker in color. Bhabar: It is found in the foot of Himalayas and generally found in low-lying areas. It is assembled with stony pebbles and coarse-grained semi-soils. Many kinds of cereal grow well in this soil. Usher: when aged sediments lose some of the minerals and nutrients and gradually become infertile, it is called as the usher. It is sometimes detrimental to plants growth. These are volcanic soils of west-central India covering 5.46 lakh sq km of the area. They are rich in magnitude, ferrous and humus suitable for cotton, coarse grains, sunflower, groundnuts and citrus fruits, and oilseeds too etc. As it is named as black soil, its color is also black. They are also called cotton soils because of the cultivation of cotton in it. They usually Retain the moisture in them and also becomes sticky in the rainy season. This soil is found in the areas where 100cm average rainfall occurs (often between 50 to 80cm). This soil is covering the plateaus of Maharashtra, Southern Madhya Pradesh, and Saurashtra and it extends eastwards in the south along the Godavari and Krishna valleys. Red soil in India is covering approximately 3.5 lakh sq km These are loamy soils which become fertile with proper irrigation. It lacks humus, phosphoric acid, and nitrogen in higher regions but rich in potash and alumina content. It is sandy and supports potatoes, groundnuts, and oilseeds in lower reaches. Red soil also supports green gram, red gram, castor seed, etc. Because of its high iron oxide content, it is red in color. Red soil covers the eastern part of the peninsular region comprising Chota Nagpur plateau, Telangana, the Nilgiri, Tamil Nadu plateau and eastern Chhattisgarh. This soil is covering around 2.48 lakh sq km area (in India) where 200cm and above rainfall occurs. Laterite soils are generally formed under high temperature as well as high rainfall. This soil is rich in iron and aluminum oxides but lacks nitrogen, phosphorous, acid potash (sometimes high) and organic matter. Laterite soils are red in color. As it is the end-product of weathering, it is indefinitely durable and cannot be weathered much further. They are found in south Maharashtra, covering small parts of Tamil Nadu, Orissa and a small part of Chota Nagpur in the north and Assam, Meghalaya in the north-east also in Andhra Pradesh, West Bengal, Orissa. It is not as fertile as alluvial soil. So, it is unsuitable for agriculture due to the high content of acidity and inability to retain moisture, but when manured and irrigated, some of the crops can be cultivated in the laterite soil e.g.- rice, sugarcane rubber, cinchona etc. It is less developed soil of hilly terrains. These soils basically have covered 8.67% of the total area of India i.e. 2.85 lakhs sq km. This soil is rich in humus so that it is acidic in nature. It is not very fertile. They are also very susceptible to soil erosion. Forest soils are rich in humus but lack potash, lime, and phosphorus. With good fertilizers, they can grow crops like tea, coffee, spices, and fruit. Mountain soil is mainly good for orchard crops (fruit- or nut-producing trees, also features large gardens). The forest and mountain soils are found in the West Bengal, Jammu, and Kashmir, Uttar Pradesh, and Uttarakhand. Read about Soil Profile here – How is Soil Formed? It is covering the area of approximately 68,000 sq km. This soil is spread in semi-arid regions of Rajasthan, Punjab, Haryana, Uttar Pradesh, Bihar, Maharashtra, and Tamil Nadu. They have a good amount of alkalis and salts and that is why they are known as saline and alkaline soils. This soil has become calcimorphic (lime-rich parent material) and rich in sodium and magnesium. They support the cultivation of coarse grains and tobacco. They can be used for rice cultivation after mixing gypsum. This soil is of wetland regions where drainage is poor. The peaty or marshy soil is rich in soluble salts and organic matter as one can find a large amount of organic matter in these soils but lacks phosphorous and potash in it. In some regions, they are used for rice cultivation. The marshy soil is known for a high proportion of vegetable matter in it. This soil is black in color with heaviness and it is highly acidic. Peaty soil is mainly found in western regions of Alappuzha district and Kottayam district. Marshy soils are found in the central portion of North Bihar and Almora district of Uttarakhand, in the coastal regions of West Bengal, Orissa, and Tamil Nadu. Desert soil is covering the area about 1.42 lakh sq km and receives less than 50 cm of annual rainfall. This soil covers the entire area of Aravalli’s in Rajasthan and some parts of Punjab, Gujarat, and Haryana. it supports a low density of populations. This soil is sandy which supports the cultivation of coarse grains. It is rich in soluble salts and phosphorous but lacks nitrogen and organic matter in it. It can be fertile if irrigated properly. Crops for e.g. wheat, groundnut, and Bajra are grown on these types of soils. As we discussed there are many types of soil in India and having knowledge of all is a good thing. 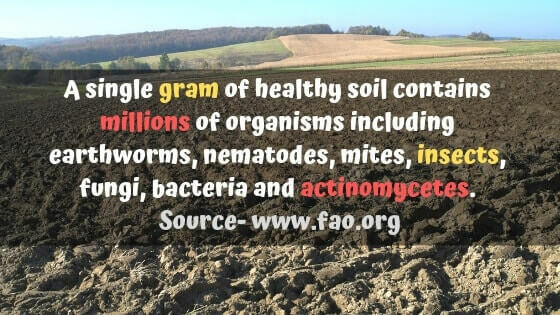 Soil comes under extremely important natural resources, especially in agricultural countries like India, Pakistan and Bangladesh. So, we should conserve these soils properly and try to protect them from pollution and other hazardous things which are present in our environment. If you like to edit or suggest something about types of soil in India then please reply in the comment section and share it on social media.